Hey gang! I’ll keep this one short and sweet as real life is keeping me busier than usual this week. On the plus side, the fact that it’s been a few days since the issue came out frees me up to talk about some of the more spoilery details. If you haven’t read this issue and, this is your cue to bow out. First off, I feel like I need to make a confession. This new volume of Daredevil still feels like it’s taking place in an alternate universe to me. This isn’t a slight on the overall quality of the storytelling or the artwork. 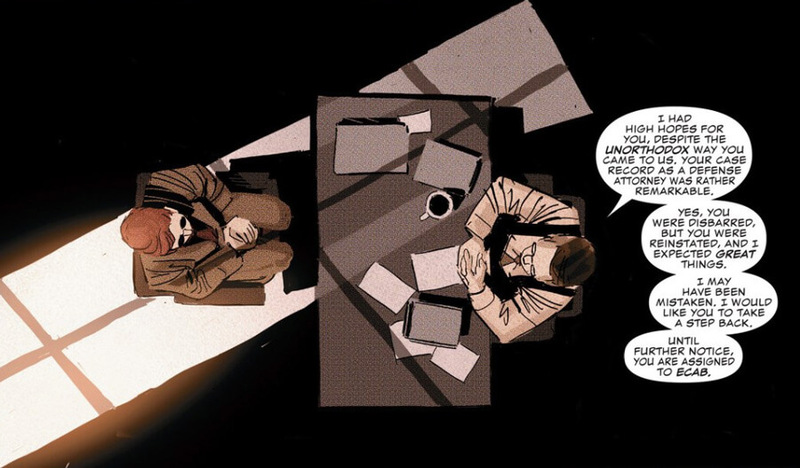 The book looks fantastic – though I do find the lack of variety in the coloring a bit distracting – and, as I’ve mentioned before, Matt Murdock still acts and talks like Matt Murdock should. I also find the new villain quite intriguing, and the addition of Blindspot brings out an interesting side of our main character. There’s just something I can’t quite put my finger on. Maybe it’s just hard to make sense of where this story fits within ongoing continuity. That’s not something that’s terribly important to me, but it does contribute to the feeling that the story is set in an alternate universe. There’s also the lack of a supportive cast. All the new people that populate Matt’s world are just that – new. We quite simply don’t know very much about them, except for Blindspot. And we don’t know all that much about him either. In this issue, we learn that strings were pulled by the people (previously) close to Matt to get him back to where he is now. It remains to be seen how this huge change came about, but we do know that Matt and Foggy are estranged, which leaves Matt’s private life – the one he must have outside of work and “play” – completely devoid of other people. And this is strange to me. The “mission,” his work as Daredevil has always been hugely important to Matt, but it’s never been everything. Maybe it bothers me that it doesn’t seem to bother Matt that his friends have seemingly abandoned him. Am I actually missing Matt’s guilt? Maybe that’s it. As things are, I find myself enjoying these issues more with my brain than with my heart. Which is how I end up feeling detached and intrigued at the same time. And, the mystery at the heart of how we got here is a big part of it. The other factor is the main villain, though I wish that The Hand had been left out of the equation. 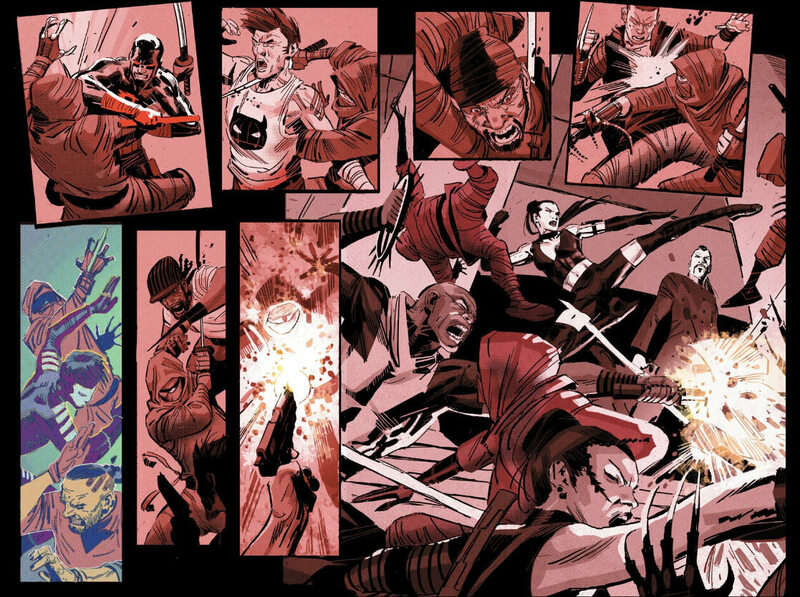 Don’t get me wrong, the big ninja war fight scene at the beginning of the issue is a thing to behold, and there are many great Daredevil stories that feature The Hand. It’s just that I was expecting Tenfingers to be a different kind of sinister. Of course, just as I’m starting to dismiss him as derivative, he shows up on the last page and starts creeping me out again. You have perfectly described what I’ve been feeling the last three months. I have yet to feel invested in the latest relaunch. At least there was a passing reference to Kirsten in this issue. And I agree wholeheartedly about the color palette — or the lack of one. For me the art doesn’t feel like it’s jumping off the page at me. I really hope we get some clarity soon on what happened between the end of SF and the return to NYC. Limited colour palettes are very difficult to pull off. Matt Hollingsworth made it work in Hawkeye. But if you’ve ever read the Greg Rucka Detective Comics that took place post-No Man’s Land, with art by Shawn Martinbrough, you’ll see a limited colour palette really hinder a book. That’s a good way to put it, that you’re enjoying this more with your brain rather than your heart. I’m still not fully onboard with this direction, while it’s pretty apparent that the Netflix show was at least partly responsible for it, the book doesn’t have the same heart as the series. I put that to the lack of a supporting cast, as you do. The art’s fantastic and so are the fight scenes. But I wish that I could care about the people in it as much as other runs that have taken a similar tone. On the plus side, it looks like Matt’s back to having red hair now. I’m still loving this new run so far. Soule knows how to write Matt Murdock and the art is gorgeous. I do agree that the supporting cast is still underdeveloped and its obvious that Soule is going to only drop hints at the big mystery for a while. I think I remember in one of his interviews that he stated he wasn’t going to deal with the mystery for a while, so we should all get ready for a slow burn on that front. Hopefully we’ll get more Foggy soon. Soule has done a good job illustrating that Matt’s new boss doesn’t really like him and it wasn’t his decision really for Matt to be there (more mystery), also some people are just assholes. That said, it came across a little too much for him to demote Matt for what went down. Shouldn’t he also be chewing out the security people? What exactly was, as far as he knows, a blind man supposed to do to stop these vicious, finger chopping, gang members? Minor nitpick. I think you hit my complaint too. The plot is moving fine, but I think Daredevil needs more of a supporting cast. Right now, they’re either undeveloped or non-existent. I enjoyed the issue, but my enjoyment declines each week the longer that happens. Everything is too focused on the big plot (and aligning his day job and night job, imo, contributes to this). There’s still time, don’t get me wrong. But the longer it takes, the more my patience wears thin. I used to collect Daredevil in trade paperback, so maybe that helped, but give him some friends. Or give him a pleasant, non-work conversation with Foggy. I don’t know, but I do think something is needed. Yes! The overall feel of the book feels as flat as the color palette. It’s got lots of very Daredevil-y things, and I want to like it, but there’s something missing. The last three issues I’ve just read, then put down on the stack and haven’t picked up again or even really thought about them. Maybe you’re right and it’s a supporting cast issue. Everything just feels a little closed-off. And, judging from Foggy’s anger, I’m a little worried Matt’s done something to get his life back that, when I find out what it is, is going to leave a sour taste in my mouth. I’m unhappy that they’re making Matt and Foggy estranged …. again. Does anyone know, in the history of the comic, what percentage of the time they actually spend being normal old friends towards each other? Wow, thanks everyone for your comments! It seems as though I’ve touched on something here that a lot of readers have been feeling, which is interesting. You never really know if it’s just you. In response to Kate’s questions, I guess I should finally get to the end of my series of posts on Matt’s relationship with Foggy. I think I’ve only written two of them so far and there’s much more ground to cover. Thanks, Christine! I always enjoy reading your posts. They’re very thorough! I think Ten Hands is interesting. I’m getting somewhat of a Micah Synn vibe with his villainy, though, so ymmv. Christine, yes please, more looks into the past. I haven’t really liked Ron Garney in this issue. The find the art was lacking in backgrounds: sometimes there were no backgrounds at all: only the characters speaking or something (like you so see so often in japanese comics). Maybe I am spoiled by Lark, Martín, Rivera and Samnee, who did really try to draw detailled backgrounds. I don’t think the new scripts are a bad thing, but I’m starting to lose interest in the series, which I have read for like 18 years now. Just not my cup of tea. Or maybe I’m tired of Daredevil, after all the years 🙂 If Waid had wrapped his thing up a little better at the end, it would have felt like a decent ending to the series. I think this run is so much the opposite of the Waid run that many of us are still in a bit of shock. Like the threshold shift after a concert, which I believe Christine has mentioned in an earlier post, are hearts are still on a different frequency then what the current run is on. Waid and co.’s run was all about the bright color pallet and the supporting cast and the “heart” of the DD mythos. I have said before that Waid’s run could send me through a range of emotions in just one issue. It was as much about what was going on underneath mentally and emotionally with the character as much as it was about the swashbuckling action. The current run is very much the opposite of all that. Its grey and color washed. Its moody and action centric with the fight scenes and plot points taking center stage. The supporting cast has been all but removed, replaced with new characters that have, for the most part, not been fleshed out yet. They are more surface level to move the plot along. This volume hasn’t found its complete voice yet. Characters and backstory are still coming to light. It will be interesting to see if we can get closer to this run as it continues to develop, or if the shift will be to much for some of us. I am with most of you, there are parts of this run that I like. The artwork is very good, even despite the lack of color, the action is great, the villain is interesting and Blindspot is growing on me. But these parts don’t make a whole. I am still looking for the depth of characterization, the emotional punch behind the plot points and the harmony that brings all the pieces and the characters together. Soule and co. have a good voice for the book and certain pieces are really good. I am interested to see if they can continue to build a more well rounded complete comic.